The benefit of wearing a winter coat depends on the dog, but all dogs could benefit from winter booties, according to veterinarian Dr. John Hanover. Still, Hanover warns owners of smaller dog breeds, especially those with short hair, to be more cautious as temperatures drop. “A husky can handle something a lot colder than a little teacup poodle that’s been body clipped,” he said. That’s because smaller dogs have a greater risk of coming in contact with snow and ice, which sticks to their fur and melts, causing the dogs problems even after returning indoors. “The wet mats the hair down and it’s harder for them to regulate and send heat through their bodies,” explained Hanover. For this reason, it’s important for smaller breeds to have multiple winter coats. Putting a dog into a coat that was made damp on a previous walk could actually make a dog colder. Hanover also suggests that dog owners, regardless of the size of their pet, use a towel after walks to dry their dog’s fur. Owners of puppies and senior dogs should also consider purchasing winter gear for their pets. According to Hanover, puppies don’t have the extra fat or energy to burn, which helps keep more mature dogs warm. Vicktery Zimmerman, an Edgewater resident and owner of a 1-year-old dachshund mix named Zoey, said she witnessed this firsthand by her dog’s behavior. The weakened joints and muscle tissue of older dogs makes them more susceptible to the negative impact of cold weather as well—particularly for those with preexisting ailments. But, at the end of the day, Hanover recommends that dog owners observe their pets to determine their individual needs. Kathie Mills of Edgewater said she used her common sense to determine when to buy her 4-year-old, black mouth cur, named Bae a winter coat. “If it’s cold for us, we figure she needs a little bit more protection too,” Mills said. Whether a dog is young and small like Zoey, short-haired like Bae, or even an average size, a winter coat has the potential to help them by regulating their body temperature and protecting their internal organs. It can’t do any harm. In fact, some research suggests that larger dogs could benefit greatly from wearing winter coats because their average body temperature is slightly cooler than their smaller counterparts. 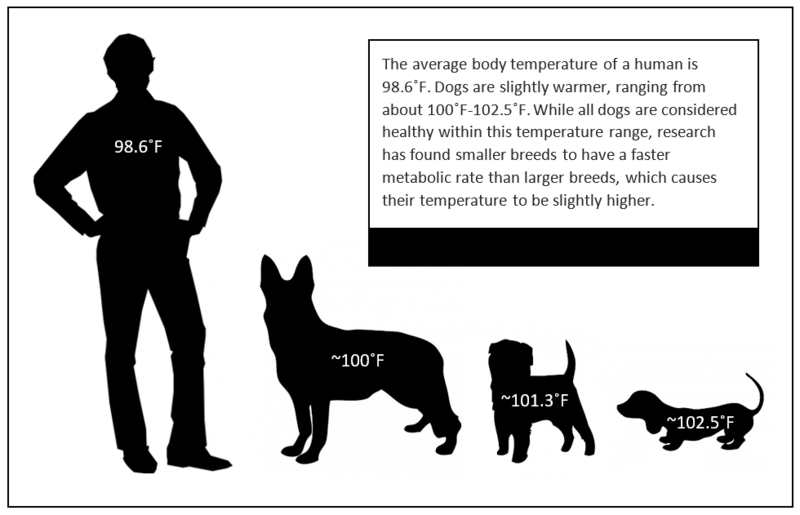 Larger dog’s average body temperature is only a few degrees higher than a human’s, and smaller dog’s average body temperature is only a few degrees higher than larger dogs. If wearing a winter coat benefits humans, as well as smaller dogs, it makes sense that it would also serve a practical purpose for larger dogs, according to research conducted by psychologist Roberto Raffinetti and published in his paper “Daily Rhythmicity of Body Temperature in Dogs,” published in Journal of Veterinary Medical Science. Accommodating breeds of all sizes is the goal of Jennifer Miller’s company, True Fit Dog Coats, which sells specialty dog coats to match breeds that don’t possess the body shape the majority of dog coats are styled for. “The most coats we sell are the coats that fit more standard bodied dogs. The special breed coats are for the dogs that have unique body shapes,” Miller said. From sizes made for dachshunds to great danes to whippets, Miller sells coats for all breeds. The coats Miller sells are made by Foggy Mountain Dog Coats. Twelve years ago, Miller accompanied her friend, and dog coat maker, to a dog show where she hoped to sell her coats, a product she has been perfecting for over 35 years. Miller said as soon as the Foggy Mountain Dog Coat booth was set up, she could see a need for an online store that could make the coats available to people around the country. Soon after, she started True Fit Dog Coats. Today, Miller’s company sells Foggy Mountain Dog Coats nationwide. The two cities racking up the most purchases are Chicago and New York. With months of snow and ice to come, Miller encourages dog owners to prepare for the cold weather. Thinking ahead involves more than just purchasing a winter dog coat. All dogs could benefit from wearing booties to protect paws from injuries cause by ice and salt. The dogs most at risk of injury are those with longer fur between their toes and pads, according to Hanover. Similar to how snow sticks to a dog’s body fur, it can get caught in their paw fur and cause painful sores. Booties can also reduce the chance of a dog being injured by the salts and chemicals used to melt ice in the winter. Jenna Turnbull, a Pennsylvania resident, first witnessed the effects of street salts last year when she attempted to take her 7-year-old Maltese/poodle mix, for a walk. 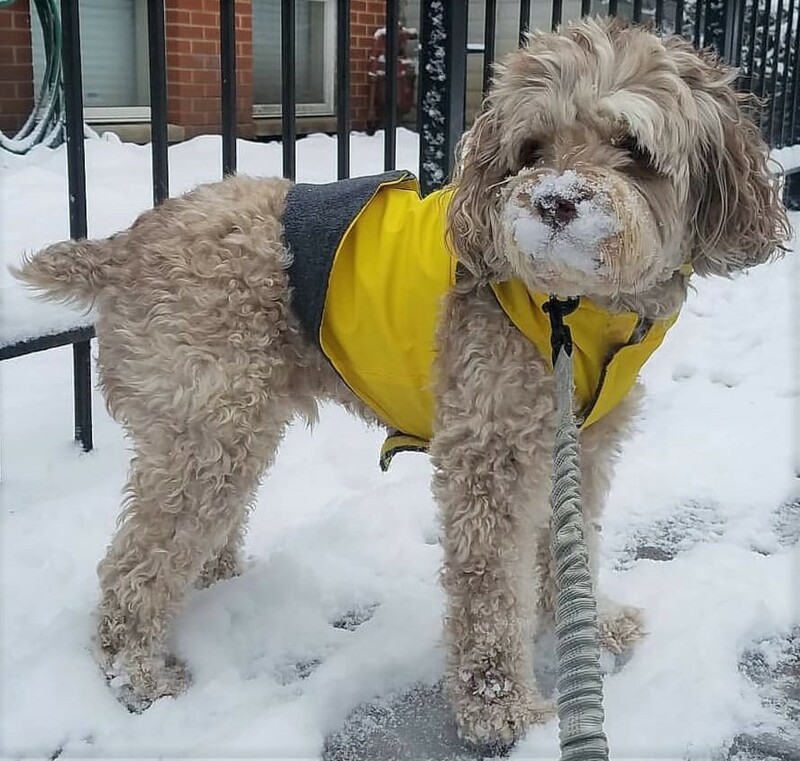 Lisa Stolley, an animal lover and English professor at the University of Illinois at Chicago, also recalled how street salt led to the injury of her dog’s paws. Stolley was right to worry about the toxicity of the salts used to melt ice. According to Steve Vernik, vice president of Gaia Enterprises Inc., using street salt is dangerous—not only to pets, but to the environment. Street and sidewalk safety are the reasons for using salt, but Vernik suggested a salt-free alternative that his company Gaia Enterprises Inc. makes. After street salt led to bloody sores on the paws of the family dog in 1985, Gaia Enterprises Inc., a company which originally sold a salt-free ice melter called Safe Thaw, decided to alter its product to make it even safer. By 1995, the company had refined the recipe of the liquid de-icer and changed the name of their product to Safe Paw. A guide to finding dog-safe ice melters can be found here. Unfortunately, dogs often come in contact with salt-based ice melters that cut their paws and can lead to them licking the toxins from their wounds. Putting booties on a dog before a walk could reduce the risk of this happening. The worst of this year’s snow and ice are still to come. Protecting a dog from cold and injury could be as simple as getting them Instagram ready by putting them into a fluffy coat and booties.